Jan. 7, North Shore Drive and Pine Avenue, alcohol violation. While on patrol, a Manatee County sheriff’s deputy observed a vehicle without taillights traveling west on Pine Avenue. Stopping the vehicle, the officer observed a 12-pack of Budweiser beer behind the driver’s seat and determined the male driver was under the legal drinking age. The deputy issued the 20-year-old a notice to appear in court for the misdemeanor and poured the beer on the ground. The man told the officer the beer belonged to his brother. Jan. 8, 9800 block of Gulf Drive, marijuana. Two deputies on patrol observed a vehicle in a parking lot with a man slumped over the steering wheel. They approached the vehicle and noticed an odor of marijuana, searched the vehicle and found a vaping device and a spoon containing a brown sticky residue. The items tested positive for THC and were seized as evidence. Charges are pending lab results of the preliminary test. Jan. 8, 100 block of Maple Avenue, suspicious incidents. A woman returned from out of town to find several leafless trees and two palm trees with palm fronds torn off. The woman told the MCSO she would check with an arborist to determine if the trees were either deliberately harmed or weather damaged. Jan. 10, Bayfront Park, 309 N. Bay Blvd., information. A bag of a green leafy substance was turned into the MCSO. A deputy secured it for destruction. Anna Maria is policed by the Manatee County Sheriff’s Office. Jan. 5, The Seafood Shack Marina, Bar & Grill, 4110 127th St. W., battery/trespass. Manatee County sheriff’s deputies separated two people who were fighting. The aggressor was arrested for battery and issued a trespass warning. Jan. 3, Martinque South condominiums, 5300 Gulf Drive, information. The building superintendent reported unknown persons left the pool shower running and threw patio chairs and a clay pot containing a plant, which broke into pieces, into the pool. Jan. 3, 100 block of White Avenue, information. A visitor from Iceland flagged down a Holmes Beach police officer and reported his $1,000 iPhone had been stolen and the bag the phone had been inside appeared to have been cut with a knife. The officer attempted to locate the phone but was unsuccessful. Jan. 4, 100 block of 34th Street, fleeing and eluding. A 15-year-old male was found in the 10000 block of Manatee Avenue after he ran from Holmes Beach police officers, who had pulled his vehicle over for speeding. Police searched the vehicle and reported finding a bong and a plastic bag with marijuana residue. He told police he fled because he was scared, having only a learner’s permit. 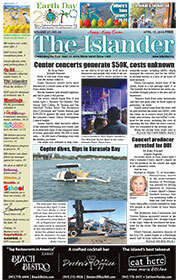 Jan. 5, Manatee Public Beach, 4000 Gulf Drive, marijuana ordinance. Observing a car in the parking lot after hours, an officer approached the vehicle and saw a marijuana-like substance on the lap of the driver. The driver and passenger were identified as under 18. The driver acknowledged having a bag of weed in the center console. He told police he and the passenger planned to “smoke a little” with friends. The driver was ticketed for possessing 4.5 grams of marijuana and paraphernalia. The contraband was confiscated and processed for destruction. Jan. 6, 200 block of 65th St., construction ordinance. A commercial painter was cited for working on a Sunday. Jan. 7, 700 block of Manatee Avenue, speeding, cocaine possession. A Toyota was clocked traveling 50 mph in a 35-mph zone. While checking the vehicle’s occupants for warrants, a passenger opened a bottle and a bag containing white powder fell to the ground. Police searched the vehicle and found 1.5 grams of a substance that tested positive for cocaine. The driver was cited for speeding and released. The passenger was arrested for drug possession and transported to the Manatee County jail. Jan. 7, Kingfish Boat Ramp, 752 Manatee Ave., camping. Police observed a man asleep in a sleeping bag next to a picnic table. An officer issued a notice to appear in court for violating an anti-camping ordinance. The man left the area. Jan. 9, Publix, 3900 E. Bay Drive, warrant. Police were dispatched to Publix Super Market regarding an employee wanted on a warrant. The manager identified the suspect. He was arrested on multiple warrants and transported to the Manatee County jail. Holmes Beach is policed by the Holmes Beach Police Department.